Boca Raton, Fla. – February 28, 2017 – Specialty-specific health information technology leader, Modernizing Medicine, Inc., will present the latest solutions in its award-winning electronic health record (EHR) system to address value-based care and improve physician efficiency at the Association of Dermatology Administrators & Managers (ADAM) Annual Meeting and the American Academy of Dermatology (AAD) Annual Meeting this week. 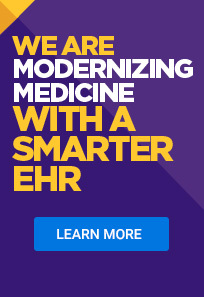 The company recently announced that EMA™, the mobile EHR system in the modmed Dermatology™ suite, is among the first in the United States to include built-in Merit-based Incentive Payment System (MIPS) intelligence, including composite score reporting, robust analytics and benchmarking reports that document healthcare providers’ performance in near real-time. The automated solution is currently available and was designed to help clients exceed the minimum threshold or achieve exceptional performance with MIPS in 2017. Dr. Sherling is scheduled to present strategies to address MIPS at this year’s ADAM conference on Tuesday, February 28, from 4:10 – 5:10 p.m. at the Loews Royal Pacific Resort in Orlando, Fla.
At ADAM and AAD, Modernizing Medicine will showcase the mobile, touch and cloud-based modmed Dermatology™ suite of products and services designed to help drive value-based decisions, promote quality care and reduce healthcare costs. The dermatology-specific suite includes EMA; Practice Management; Revenue Cycle Management; modmed Telehealth™; Pathology; Specialized Registries; and Analytics, including the Clinical Performance Activities Module which provides metrics dashboards to further help physicians track and improve the quantity and quality of referrals and find revenue gaps. Modernizing Medicine will also introduce the Patient Kiosk, a platform built to speed up the check-in process by letting patients update their personal information and medical history and sign consent forms on an iPad. Kiosk integrates with EMA to add data to the patient’s record automatically. “Clinical data is needed from all dermatologists to benefit the specialty. AAD is pleased that Modernizing Medicine is now offering the option for their users to contribute to DataDerm,” shares Marta J. Van Beek, MD, MPH, FAAD, Assistant Secretary-Treasurer of AAD, and Chair of AAD’s Ad Hoc Task Force on Data Collection. Used by over 35 percent of U.S. dermatologists, EMA has been named the #1 EHR system for three consecutive years by Black Book Market Research and the top ranked system for dermatologists in the inaugural KLAS® Ambulatory Specialty 2016 One Size Does Not Fit All Performance Report. Attendees at the upcoming dermatology conferences can learn more about modmed Dermatology at booth #19 at ADAM from Feb. 27 to March 1 and #2665 at AAD from March 3 to 5 during exhibit hours. For more information about the events, please visit the Association of Dermatology Administrators & Managers here and the American Academy of Dermatology here. *‘CommonWell Health Alliance’ and the CommonWell logo are licensed trademarks of CommonWell Health Alliance in the U.S. and other jurisdictions.